At Berkeley Hall, you’ll find our Premier Builder Program ensures a welcoming experience that will make you feel right at home. With three industry leaders onboard, Arthur Rutenberg Homes, ACH Custom Homes and Grayhawk Custom Homes, our beautifully appointed, high-end custom homes invite future homeowners to see themselves here and fall in love with our community. Innovative Design & Beauty - Your Custom Lifestyle Home from ACH Custom Homes. Design your dream home with all the amenities that reflect the ease of Lowcountry living. 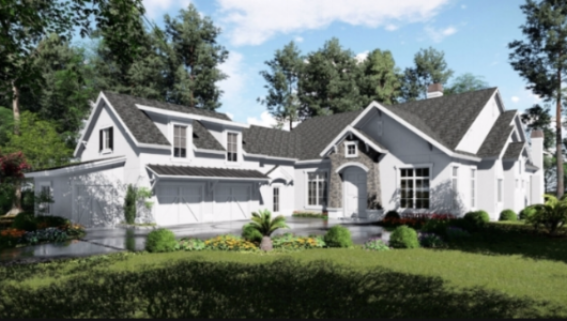 This Lifestyle Home is among an array of custom featured plans designed for Berkeley Hall. With a commitment to design excellence, the ACH experience is a special blend of elegance, coupled with modern innovation and distinctive vision. To preview ACH Custom Homes upscale architectural interiors and learn more about their highly-acclaimed team, click here. Newly introduced for Berkeley Hall – The Monceau is among seven featured plans for our community by Arthur Rutenberg Homes. You’ll find them well acquainted with our properties, from peaceful parkland settings to pristine waterfront and golf course views. A knowledge property owners can draw upon, to assess each homesite is perfectly placed for evening breezes, sun, shade and gorgeous views. Lowcountry Living at Berkeley Hall – Charleston's renowned Grayhawk Custom Homes will introduce their Berkeley Hall custom model early in 2018. It's easy to see yourself here in the casually upscale interiors that signify Grayhawk Custom Homes. From individual design choices to a wide range of architectural elements, Grayhawk has garnered wide recognition for their design acumen and professional follow-through. They now bring that commitment to Berkeley Hall and look forward to welcoming you to your new home. Grayhawk Custom Homes and their team, have been recognized by Entrepreneur Magazine and Builder Magazine as one of the fastest growing builders in the U.S. More information on the custom Berkeley Hall residence coming soon.